Do you have trouble living a normal life because of weak, damaged or misshapen teeth? Dental crowns are just what you need to restore your smile. A dental crown is the name given to a tooth-shaped cap that a dentist places over a weak or damaged tooth to restore its size, shape, and strength or to improve its appearance. Upon the completion of the dental crown procedure, it fully encases the part of the tooth that lies above the gumline. Protect weak teeth from breaking, such as a decaying tooth. Prevent cracked teeth from splintering by holding them together. Restore teeth that are already broken or severely worn out. Cover and support teeth with large fillings when there aren’t any teeth. Hold dental bridges in place. Cover teeth that are misshapen or badly discolored. Help save decayed teeth that can’t support fillings. Protect teeth that are at high risk of decay. Dental crowns may be made of stainless steel, gold, platinum, or an alloy of metals, such as a nickel-chromium alloy or cobalt-chromium alloy, porcelain-fused-to-metal, resin-fused-to-metal, all-porcelain, all-ceramic, and all-resin. Stainless steel dental crowns are used as a temporary measure to protect teeth or fillings while a permanent crown is under construction. In children, they are used to cover and protect decaying teeth. 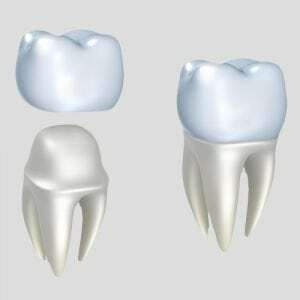 Dental crowns with a high content of gold or platinum are very strong and long-lasting. The same is true for crowns made from an alloy of metals, such as a nickel-chromium alloy or a cobalt-chromium alloy. Dental crowns made from porcelain-fused-to-metal or resin-fused-to-metal can be made to match the color of the adjacent teeth. However, they wear more quickly than metal crowns. The porcelain or resin portion of the crown can also chip or break off. All-ceramic and all-porcelain crowns can be made to match the natural colors of the teeth. All-resin crowns are cheaper but not long-lasting. Examining the affected tooth and diagnosing the problem: We will examine the affected tooth and diagnose the problem and may take one or more X-rays of the tooth, including the surrounding bone. If the tooth has suffered extensive decay, we may perform a root canal treatment (RCT) first. Preparing the affected tooth for the dental crown: We will numb the tooth and surrounding gum tissue (using a local anesthetic) and file down the chewing surface and the sides to make space for the crown. If, on the other hand, a tooth has lost a large chunk, we will build up the tooth using the filling material to support the crown. Making an impression of the tooth: We will then make an impression of the tooth using a paste or putty or a digital scanner. We will also make impressions of the tooth above or below the tooth receiving the crown to see if the crown will affect your bite. The impressions (or scanned copies) will be sent to a dental lab, where the crowns will be made, with specific instructions, such as what material to use and what color to match. The lab will take –four to five weeks to make the crown. Protecting the prepared tooth with a temporary crown: Before sending you home, we will put a temporary crown on the prepared tooth to protect it from possible damage. The temporary crown may be made from acrylic and held in place using a temporary cement. Receiving the permanent dental crown: The last step will be to remove the temporary crown, numb the tooth and surrounding gum tissue, and then place the permanent crown on the tooth — using a special cement to bond it. The entire dental crown procedure takes four to five weeks. Dental crowns are strong and long-lasting. Once put in place, they can last from five to 15 years. Also, they don’t require any special care. It is always best and recommended to practice proper dental hygiene.